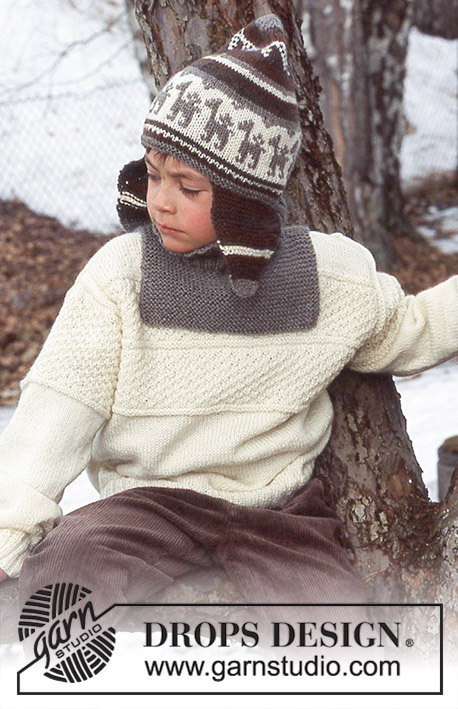 Go to original pattern for design DROPS Children 12-40. Size: 3/4 – 5/6 – 7/8 (9/10-11/12-13/14) years. Pattern: See diagrams M.1 and M.2. For the back and front pieces knit the pattern as follows: *M.1, then M.2 for 5-5-6 (6-7-7) cm / 2"-2"-2 3/8" (2 3/8"-2 3/4"-2 3/4")*, repeat from *-* a total of 2 times and finish with M.1 (= approx 16-16-18 (18-20-20) cm / 6 1/4"-6 1/4"-7" (7"-8"-8") in total). 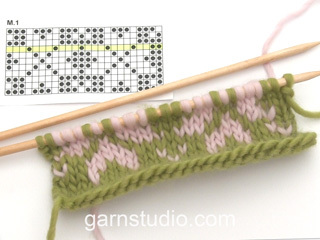 Cast on 74-82-86 (94-102-106) sts ( includes 1 edge st each side) with Karisma on needles size 3 mm / US 3. Work 4-4-4 (5-5-5) cm / 1½"-1½"-1½" (2"-2"-2") in rib with an edge st in garter st each side. 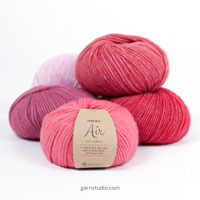 Change to needles size 4 mm / US 6 and continue in stockinette sts. REMEMBER THE GAUGE! When the piece measures 18-21-23 (24-24-26) cm / 7"-8 1/4"-9" (9½"-9½"-10 1/4") work the pattern – see explanation above- with an edge st in garter st each side. At the same time when the piece measures 25-27-30 (31-32-33) cm / 9 3/4"-10 5/8"-11 3/4" (12 1/4"-12½"-13"), bind off 4-6-6 (8-10-10) sts each side for armhole (bind off in the beg of next 2 rows) = 66-70-74 (78-82-86) sts. Continue in pattern and an edge st each side. After the pattern (see above) continue in stockinette sts until finished measurements. When the piece measures 36-38-42 (43-45-47) cm/14 1/4"-15"-16½" (17"-17 3/4"-18½") bind off the mid 14-14-16 (16-18-18) sts for neck and work each side separately. Continue to bind off in beg of every row from neck : 2 sts 2 times and 1 st 4 times = 18-20-21 (23-24-26) sts left for each shoulder. Bind off remaining sts when the piece measures 40-43-47 (49-51-53) cm / 15 3/4"-17"-18½" (19 1/4"-20"-21"). Cast on and work as the front piece. Bind off for armholes as for the front and continue until the piece measures 38-41-45 (47-49-51) cm / 15"-16 1/8"-17 3/4" (18½"-19 1/4"-20"). Bind off the mid 26-26-28 (28-30-30) sts for the neck and work each side separately. Continue and on next row from neck bind off 2 sts 1 time = 18-20-21 (23-24-26) sts left for shoulder. 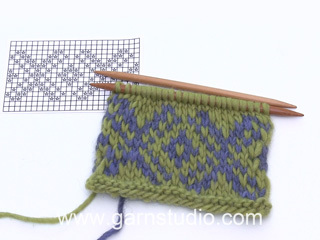 Cast on 46-50-50(54-54-58) sts ( includes 1 edge st each side) with Karisma on needles size 3 mm / US 3. Work 4-4-4 (5-5-5) cm / 1½"-1½"-1½" (2"-2"-2") in rib with an edge st each side. Change to needles size 4 mm / US 6 and continue in stockinette sts. Please read all of the sleeve section before continuing! When the piece measures 7 cm / 2¾'' inc. 1 st each side, repeat on every 3 cm / 1 1/8" (alternate the inc between every 8th and 9th row) a total of 9-10-11 (12-13-14) times = 64-70-72 (78-80-86) sts. At the same time when the piece measures 23-26-29 (32-35-38) cm / 9"-10 1/4"-11 3/8" (12½"-13 3/4"-15") work diagram M.1 and then continue to work M.2 – incorporate new sts in the pattern as you go along. 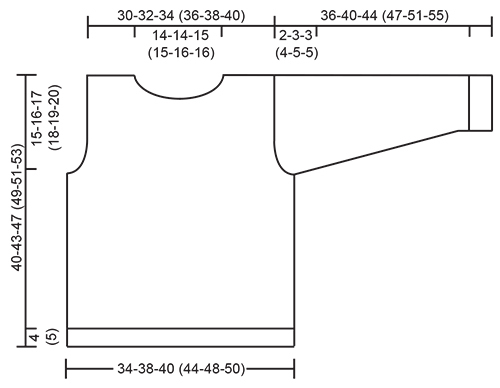 At the same time when the piece measures 34-37-41 (43-46-50) cm / 13 3/8"-14½"-16 1/8" (17"-18"-19 3/4") insert a marker each side (this marker marks where to sew the sleeve to the front and back piece). At the same time when the piece measures 34-38-42 (45-49-52) cm / 13 3/8"-15"-16½" (17 3/4"-19 1/4"-20½") work diagram M.1, and then bind off when the piece measures approx 36-40-44 (47-51-55) cm / 14 1/4"-15 3/4"-17 1/4" (18½"-20"-21 5/8"). Pick up approx. 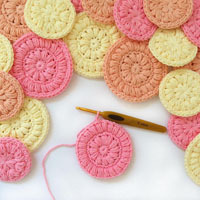 80 to 92 sts (divisible with 4) around the neck with Karisma on double pointed needles size 3mm/US 3. P 2 rounds and K 1 round. Continue in rib. When the neck measures 5-5-6 (6-7-7) cm / 2"-2"-2½" (2½"-2 3/4"-2 3/4"), K 3 rounds (for the roll over edge) and then bind off. Sew the sleeves and the side seams inside the edge sts. 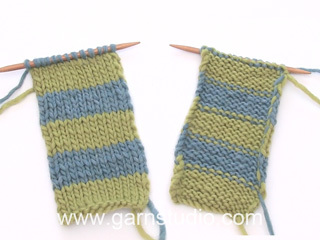 Gauge: 21 sts x 28 rows on needles size 4 mm / US 6 in stockinette sts. = 10 x 10 cm / 4'' x 4''. Pattern: See diagram M.3 and M.4. Work M.4 in stockinette sts. 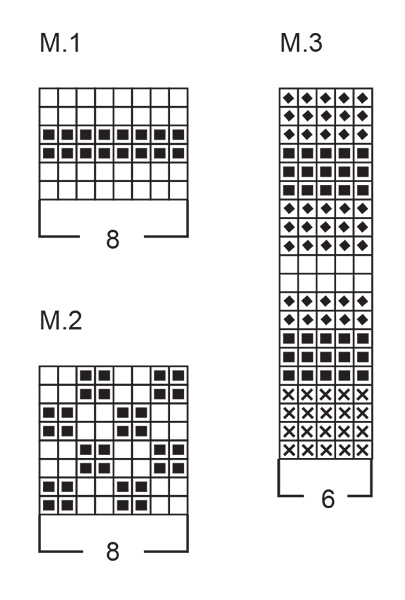 M.3 are worked in garter sts, this means that 1 row in the diagram = K 2 rows. 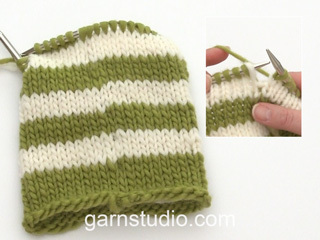 The earflaps are worked in M.3, therefore it is necessary to cut and fasten the yarn ends for each stripe. Cast on 5 sts with light brown and needles size 4 mm / US 6. Work in garter sts according to diagram M.3 – see explanation above ( if you haven’t reach the final measures when finish with M.3 continue in the same color as the last stripe) - at the same time after 2 rows of garter sts, begin to inc – inc 1 st each side as follows: Make a yo inside the 2nd st each side – twist and knit the yo on the returning row, to avoid a hole – inc. 1 st each side on every 4th row 8-9-10 times = 21-23-25 sts. Continue in garter sts until the flap measures 8-9-10 cm / 3"-3½"-4". 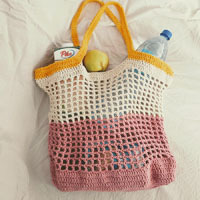 Put aside and knit another one. Put one of the earflaps on needle size 4 mm / US 6, cast on 14-16-18 new sts in the last color of M.3 for the back and knit in the other earflap on the same row = 56-62-68 sts. Knit 4 rows back and forth in garter sts over all sts – at the same time inc 1 st each side on every other row (as done for the earflaps) 2 times = 60-66-72 sts. Change to light brown and cast on 28-30-32 sts in between the earflaps for the front = 88-96-104 sts. Change to double pointed needles size 4 mm / US 6 and continue to work the hat in the round – now do all measures from this point! Work 4 rows of garter sts over all sts, cut the yarn. 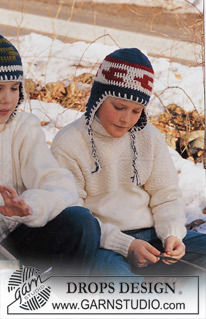 Begin at the mid back of the hat – continue in stockinette sts over all sts following diagram M.4 and until finished. At the same time, when finished the lama pattern, dec 8 sts evenly distributed on the 4 rounds marked with an arrow in diagram = 56-64-72 sts. Continue to dec according to diagram = 7-8-9 sts remain. Cut the yarn, pull through the remaining sts and sew tight. The hat measures approx 25 cm / 9 3/4'' from the front edge and to the top. Hej Helene, den hittar du under DROPS Children 12-26. Dear Mrs Moffett, M1 and M2 are the diagrams you will find at the very bottom of the page - click here to read more about diagrams. Happy knitting!